People Helping People is the motto of this town and it lives up to it for sure. I started the day a little groggy and Peter, who works at a local restaurant noticed my fuzziness and provided a free coffee with my breakfast sandwich. It really hit the spot. Low on flyers I hand out, Sandy from a local printing shop gave me enough free copies for a few days. This sort of hospitality happened all day long. What a gracious community. Deputy Fire Chief Andrew Bencomo was thrilled to see The Kindness Bicycle pull up to the Front door of his Firehouse. He and I talked about reaching kids at an early age with solid messages. He is training for a marathon and I gave him advice on not skipping any of the long training runs as I did several years ago. Ouch! The first person I met heading into Police Headquarters was Sandy, who works for the Las Cruces Police Department. She was at Ground Zero as a Chaplain for 9 months and offered her moral support as The Kindness Bicycle Ride for Heroes ends at Firehouse 10 in Ground Zero. Police Chief Richard Williams took the time out of his busy day to meet with me. He is a big supporter of getting a strong message to kids. He gave me his words of support and a Police department patch and pin. We had a great visit talking about his town. A huge One Million Acts Of Kindness thank you to Steve Ramirez and Robin Zielinski, Las Cruces Sun-News reporter and photographer for the great interview. KRWG reporter Tiffany interviewed me in the late afternoon for the local University television station. Thank you to Tom Townsend a Las Cruces for the inspiring words. Las Cruces is all about People Helping People…and with a view like the photo above, from Wikipedia, how can you not visit this city. 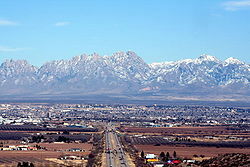 Thank you to everyone for making my visit to Las Cruces a great one. This entry was posted on Wednesday, April 18th, 2012 at 10:28 am	and is filed under Kindness. You can follow any responses to this entry through the RSS 2.0 feed. You can leave a response, or trackback from your own site.